Review: Formed of Alice Castagnoli, Alessandro Costantini and Vincenzo Viceversa, the UM:BROS project dates back to 1984 with the trio mainly playing live, including performances at one of Italy's first electronic music clubs - Suburbia in Perugia. The trio signed for the legendary Italian imprint House Of Music and recorded an album, The Law Of The Three Trees: Motus, but it never saw release thanks to the short lifespan of the label. 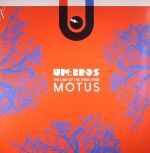 Over thirty years on the album and UM:BROS finally get their moment in the spotlight with this LP edition of The Law Of The Three Trees: Motus which veers through electronic, new wave and italo-disco in a modern and updated style!